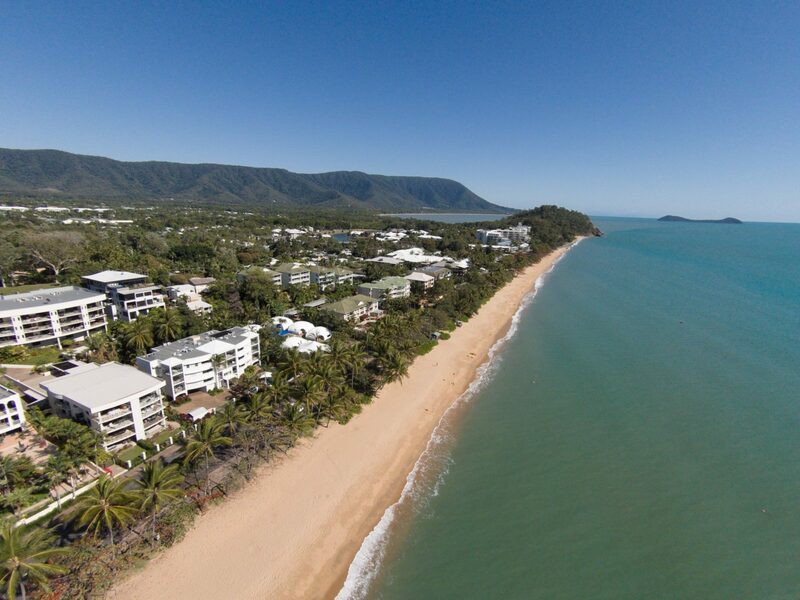 Nestled on the spectacular beachfront and set against a magnificent backdrop of the rainforest, On the Beach Holiday Apartments is your premium holiday destination at Trinity Beach in Cairns, just a 15 minute drive north of the Cairns International Airport. 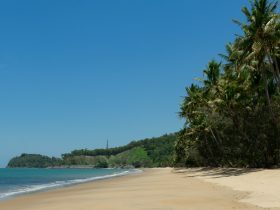 On The Beach Apartments are made up of seven individual properties offering 39 self-contained apartments. 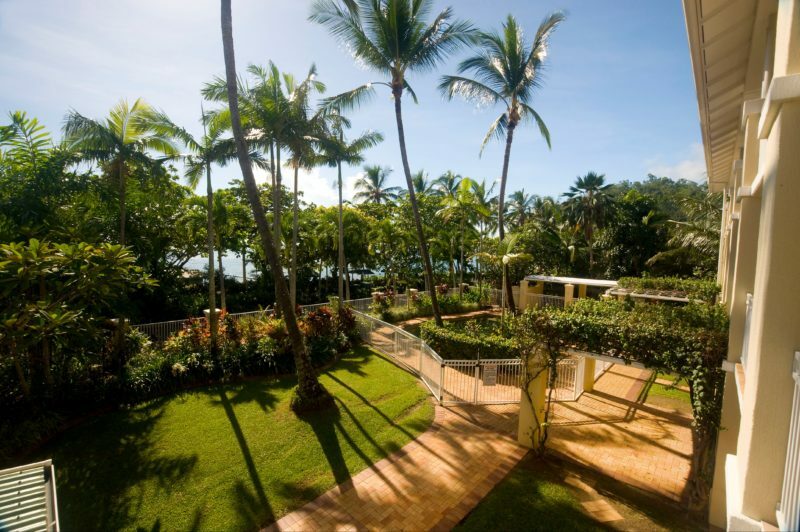 Each connected by paths and walkways through tropical, landscaped gardens and each offering private facilities including swimming pool and covered alfresco barbecue area. Free WiFi, free on site car parking and secure buildings. All properties are a maximum of three levels, accessible internally by stairs (there is one property with a lift and one with an external stairway). 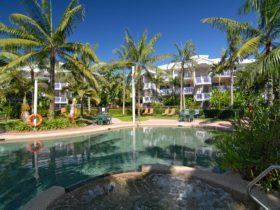 Quality spacious one, two and three bedroom beachfront apartments are available offering breathtaking views of the ocean or the lush tropical gardens from your own private balcony with alfresco dining. 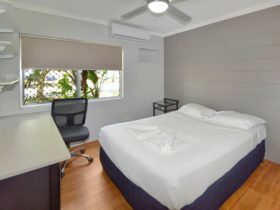 Each apartment features modern furnishings with full air-conditioning, well equipped kitchen, laundry facilities, flatscreen television with DVD/CD player. These one bedroom beachfront apartments are modern yet comfortable. They are self-contained and feature a separate bedroom with queen size bed, living area, two-way en suite bathroom, private balcony with alfresco dining and a well-equipped kitchenette including fridge, microwave and two burner cooktop. 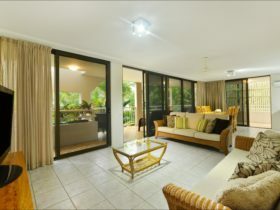 The large double opening sliding glass doors provide stunning views of the beach, ocean and pool area. Ground floor apartments have direct access to garden and pool area, ideal for elderly people or people with small children (some rooms have hand grips for easy access into bath/shower – request when booking). Three bedroom beachfront family apartments are elegantly designed to capture the ocean breezes through open windows and large balcony doors with spectacular views of the beach and ocean. Well appointed, spacious, fully self-contained apartments that feature three separate bedrooms, living area, two bathrooms and a fully equipped kitchen including fridge / freezer, diswasher, microwave, oven and cooktop. Free onsite secure undercover parking is available. Ideal for family holidays, two bedroom Oceanview apartments are spacious and comfortable, with magnificent, panoramic view of the ocean from your own private balcony. 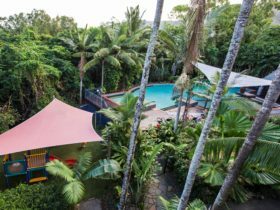 The apartments are fully self-contained featuring two separate bedrooms, living area, two bathrooms and a fully equipped kitchen including family size fridge / freezer, dishwasher, microwave, oven, full laundry, air-conditioning in all rooms. TIP: If you have trouble with stairs, please discuss your apartment choice with the friendly team prior to booking as these apartments are elevated to make the most of the spectacular views that await your arrival. The spacious, comfortable two bedroom garden view apartment offers beautiful views of the tropical gardens and swimming pool area from your own private balcony. 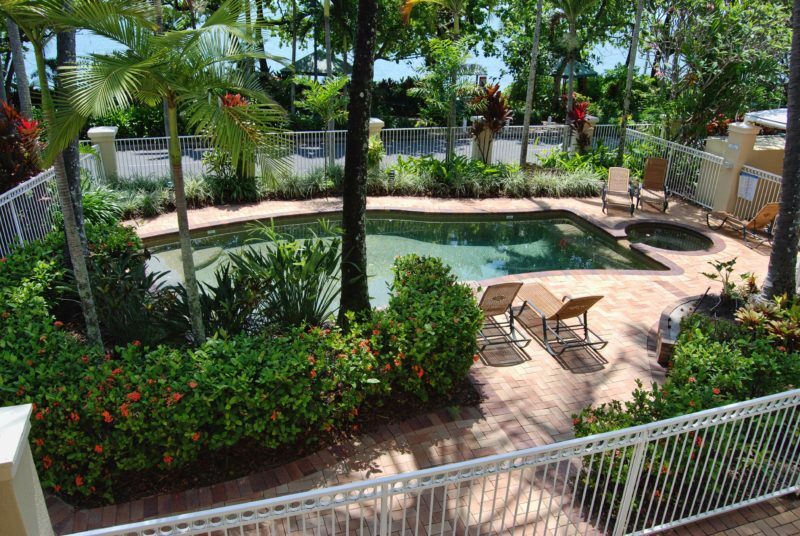 Some apartments include ocean view glimpses, offering a nice surprise when you arrive. Fully self-contained with two separate bedrooms, living area, two bathrooms and a fully equipped kitchen including fridge / freezer, dishwasher, microwave, oven, full laundry, air-conditioning in all rooms. Free undercover parking available. TIP: If you have trouble with stairs, please discuss your apartment choice with the friendly team prior to booking as these apartments are elevated behind the beachfront apartments. Two Bedroom Beachfront Apartments are designed to capture the ocean breezes through open windows and large balcony doors spectacular views of the beach and ocean. Well appointed, spacious, fully self-contained apartments that feature two separate bedrooms, living area, two bathrooms and a fully equipped kitchen with full size fridge / freezer, diswasher, microwave, oven and cooktop. 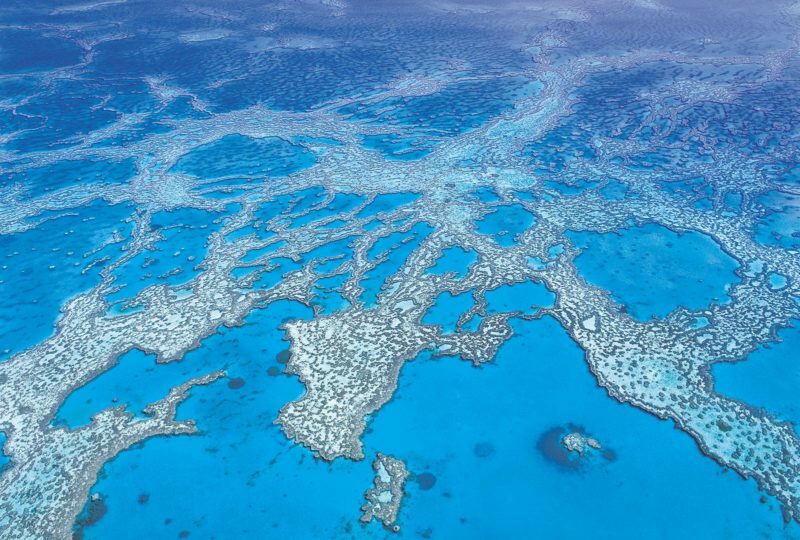 Each apartment has air-conditioning in every room, private laundry. Lift access is available – subject to availability and special request. Free onsite secure undercover parking is available.